Turn your Tripp Trapp into a stand-alone high chair with the Stokke Tray. Perfect for quick feedings or crowded tables, the Scandinavian designed Stokke Tray’s clean lines compliment the Tripp Trapp for a unique, stunning seat. Suitable for 6 months to 3 years. BPA-free plastic is easy to clean for quick spills. 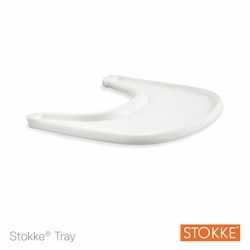 * The Stokke Tray is not designed to hold the child in the chair. We recommend you always use the Tripp Trapp harness when your child is seated in the chair.